With the regular season starting just one week from today—when the Red Sox play the A’s in Tokyo—it’s time to take a look at what milestones players could achieve this year and how probable they are. 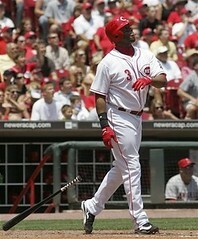 Ken Griffey Jr.’s 600th home run. Junior has 593 jacks and is a lock for notching No. 600 this year. Plus, he needs 116 more bases to hit 5,000 total bases. He had more than 200 in each of the past three seasons, so unless he suffers a truly hideous injury, he should also surpass this mark easily. Manny Ramirez’s 500th home run. Manny has 490 regular season dingers heading into this year. It’s not a question of whether he’ll hit that 500th round tripper, but when. I’m predicting late May, possibly early June if he has a slow start. Gary Sheffield’s 500th home run. He’s got 480 right now. He’ll knock in No. 500 sometime in August. Chipper Jones’ 400th home run. 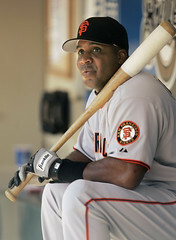 He needs just 14 more to hit the mark, and he has never had a season in the bigs with fewer than 20. Juan Pierre’s 400th stolen base. The man steals an average of 54 per season, and swiped 64 last year. Plus, he’s played 162 games for the last five seasons running. Think he’ll be able to get the 11 more he needs to reach 400? Yeah, so do I.
John Smoltz’s 3,000th strikeout. He needs 25. For Smoltz, that’s, like, four mediocre starts. Greg Maddux’s 5,000th inning. He needs 185 and two-thirds to get there. The man’s a horse. He’ll get ‘er done (and log his 20,000th batter faced in the process). Tim Wakefield’s 100th wild pitch. He’s just 8 away, he throws a knuckleball, and his personal catcher just got released. Enough said. Tom Glavine’s 200th loss. He’s at 199 right now. This is as close to a lock as preseason predictions get. Randy Johnson’s 300th win. Last year, when Tom Glavine notched his 300th victory, certain sportswriters wondered whether we’d ever see such a feat again. But it could happen as soon as this year, as the Big Unit needs just 16 more victories to get there. Yeah, he only had 4 last year. But in the three previous seasons, when he was 40, 41, and 42, he had 16, 17, and 17, respectively. Wonder why he keeps having back surgery? This milestone is why. He’ll keep coming back until he hits that nice, round number—if not this year, next year. The D-Backs are a good, young team, and they’ll help him get there. Andruw Jones’ 400th home run. He needs 32 to get there, and has had five seasons with more than that number. On the other hand, he’s also logged five seasons with fewer. Toss-up. Vladimir Guerrero’s 400th home run. Vlad needs 35 to get it done, which would be a very good year for him. However, it’s entirely possible—especially in a lineup strengthened by Torii Hunter. Omar Vizquel’s 400th stolen base. Yes, he’s lost a step with age. But the odds are even on him snagging the 20 he needs to reach the milestone. Eric Gagne’s 200th save. Can he get 23? The man he’s replacing in Milwaukee will do it (see above) but the French Canadian hurler hasn’t saved even 20 games since 2004. On the other hand, ’04 marked a three-year period in which he logged 152 saves. Anything could happen. Tom Glavine’s 700th start. He needs 31, and the last time he had fewer was in 1995. On the other hand, he’ll be 42 this season and could run utterly out of gas. 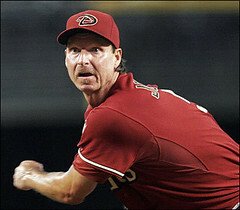 Randy Johnson’s 100th complete game. He only needs two more, but he did snag two in 2006, four in 2005, and four in 2004. It’s surprisingly possible. Roger Clemens’ 5,000th inning. It seems that the Rocket has retired for good this time. He’s forever going to be 83 and a third from 5,000. Johnny Damon’s 100th triple. Okay, this is a bit silly. There’s no “100 triples” club. But Damon, 33, is third on the active list of leaders in triples (after fortysomethings Steve Finley and Kenny Lofton) and needs just 13 three-baggers to break the century mark. The odds of him doing it this year are extremely slim—his legs just aren’t what they were when he was in his 20s—but he could definitely do it next year. Jeff Kent’s 400th home run. Like Guerrero, he needs 35. However, Kent has only hit that many once his his career. If Kent wants to reach 400, the 40-year old will have to hang around another year. That shouldn’t be a problem for the man whose watchword has long been durability. Jason Giambi’s 400th home run. Once, Giambi seemed a lock for reaching this milestone. But once, he was on the juice. He needs 36 homers, which isn’t out of the realm of possibility. I just don’t think he’s healthy enough to get there this year. You can put your over-unders in the comments section. If you’re right on the money, and we remember to check back in October, you might get an UmpBump sticker! Oooh, swag! One inning doesn’t say that much, especially in spring, but if I’m right I’ll graciously accept apologies. I hope I’m wrong, but I’d say he’s finished.